We haven’t yet gone far enough in bridging the gap between users’ social behavior and product design. The next step is to infuse personality into the products that we create. I love my [blank]. My [blank] is my workout buddy. I think my [blank] hates me. My [blank] is like a member of the family! We hear statements like these all the time. Of course, we all know people who we love or hate. People who are companions that we’ve grown close to. But, what if you replaced the blanks with product names instead? Surprisingly, they sound just as credible. People are social beings. And we treat the objects in our lives as social actors. Whether products are physical objects, software, company services, or combination of all three, we define them not just by their features, but by our very interactions with them. UX design has now moved beyond its traditional goals of usability and efficiency. We now design for desirability, seductiveness, and persuasion. Indeed, there are numerous books and articles on how to design for emotional response, each promising to enrich the product experience. This is a great direction for UX design to take, but we haven’t yet gone far enough in bridging the gap between users’ social behavior and product design. The next step is to infuse personality into the products that we create. Designing personality can lead to more satisfying and meaningful relationships with users. We create personality when a product says or does something in a way that lets users attribute human qualities to it. To design personality, we must first understand it. Psychology offers numerous models of personality that center around free will, biology, genetics, and even the unconscious mind. For the purpose of designing products, we can consider personality as a combination of thoughts, feelings, and behaviors. Until computers develop an unconscious mind or the desire to take over the world, this simplification will suffice. There are two parts to this equation. Conveying personality is not just matter of adding a witty line of copy or a logo with a smiley face without any behavior to back it up. Nor is it a robotic handshake without any warmth or intention. We create personality when a product says or does something in a way that lets users attribute human qualities to it. So, not only do you need both parts of the equation, you generally need to design them with the intention of developing a personality. Techniques for designing personality range from creating full-blown personality models that are suitable for artificial intelligence to ad-hoc solutions that occur during a typical design process. Personality design has been around for a long time. There are some existing methods that designers have employed, and there has been a little research on the topic. Techniques for designing personality range from creating full-blown personality models that are suitable for artificial intelligence to ad-hoc solutions that occur during a typical design process. Chris Crawford created one of the most complete personality models back in the early days of Atari. 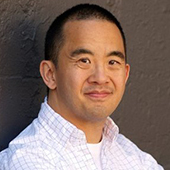 He was part of the Atari games research group and published a book titled Chris Crawford on Interactive Storytelling. In the book, he details a personality model that is specific to game design. Designing personality begins by mapping all possibilities of interactions between characters and the story world that they inhabit. The designer describes each character’s personality in detail by generating a set of intrinsic, mood, relationship, and other personality attributes. Once the modeling is complete, the software can programmatically determine the personality of the characters, their context, and their behavior when interacting in the game. As you can imagine, it’s a great model for designing virtual characters in a finite, virtual world. Unfortunately, many of us outside the game design industry might find using this model impractical—either because we do not need something this robust or because the world in which we live is infinitely more complex than a virtual one. At the other end of the spectrum, personality makes its way into product design in smaller ways. Tiffany Gimbel, a Senior Copywriter at Zappos, infuses personality into what would otherwise be generic, system-generated email confirmations. Tiffany describes her mission: “Our goal is to infuse every triggered and transactional email with equal doses of humor, information, and conversational tone. Ultimately, we want users to feel like they’re more than just customers to us….” Tiffany does not work from a tangible personality model, and she doesn’t need one. All she needs to do is contribute her piece of the Zappos puzzle, so users experiencing multiple touchpoints get a sense of Zappos—not as a faceless corporation, but as a company with people who care. You can design for personality just as effectively using a full-blown model or a style guide. 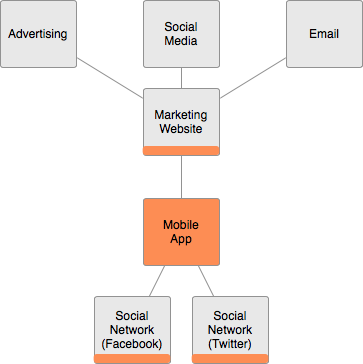 What matters is that your method fits the product context and users’ social needs. Still, there is much opportunity for UX designers to incorporate personality design into our existing design process. Articulate the product’s reason for being, and envision how it will fit into peoples’ lives. Be clear about the context in which people will use it, and think about the product’s significance to users. Please keep these steps in mind. You can adapt them to whatever design process you currently employ. Example—Company X wants to create a tool that helps people to eat healthily. They know that their audience struggles with this, and research has shown that a product that tracks people’s food intake and keeps them accountable would be effective. They know that, for the product to be successful, people should be able to access it anywhere and anytime—for example, at a restaurant at dinnertime. Determine what personality traits would enable your product to reach its goals. Write them down and begin to describe your product as a person. There as many personalities as there are people on this planet. Through user research and brainstorming sessions, determine what personality traits would enable your product to reach its goals. Write them down and begin to describe your product as a person. Who does this product need to be? And more importantly, what type of person would not be effective? Defining negative attributes for your product is just as effective as defining positive ones. Example—The product is a motivating coach that cheers users on when they set goals and achieve them. But the product is also compassionate and wants to be proactive in helping users if they fall short of their goals. Above all, the product never judges users. Nor should it ever make them feel like they’re a disappointment. If you need help getting started, do a search for personality traits, and review each one with your team. You can put pluses next to attributes you want to include and minuses by attributes that you want to avoid. If you want to take a more nuanced approach, you can score each trait on a scale from 1–5. In the end, you should have a list of traits that you can use to articulate your product’s personality in a few sentences. Table 1 shows a list of positive and negative personality traits that a product might have. Note:—The strength of traits is on a scale from 1–5. 3. Define the personality’s scope. What touchpoints exist, and should they deliver a consistent personality experience? Are you designing a stand-alone product, or does it tie into an entire product ecosystem? What are the limits to its area of influence? What touchpoints exist, and should they deliver a consistent personality experience? Example—The product is a mobile application. The company will promote the product on its Web site. This is a stand-alone app for the most part, but it will use social-media platforms to generate and pull in messages in the form of friendly challenges. Figure 1 represents this product ecosystem. 4. Define the product architecture. Map out your product and identify the general areas that personality design should influence, as shown in Figure 2. Describe the basic character that will guide the assignment of individual personality traits later on. 5. Define the user flows. Think about all of the potential pathways that users would take through the product. Think about all of the potential pathways that users would take through the product. Figure 3 shows an example of a user flow for an application that lets the user log meals. 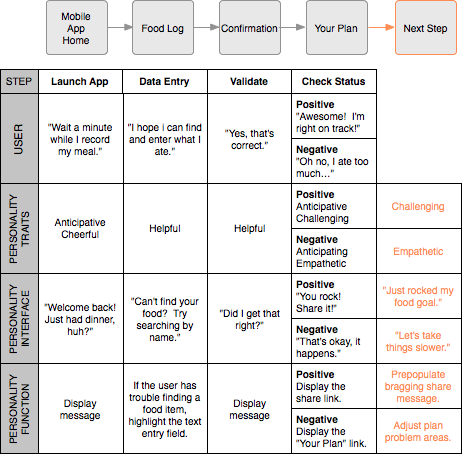 In addition to steps and user interfaces, include what the user is doing and thinking at the time, as shown in Figure 4. 6. Design the product’s personality. Product personality is contextual and should adapt to the moment. Product personality is contextual and should adapt to the moment. 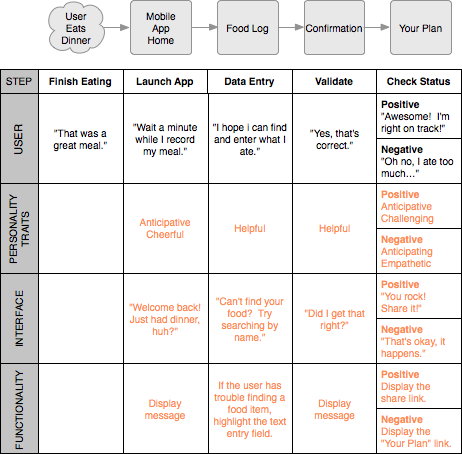 Outline what the product’s personality would cause it to do and say in specific contexts to enable it to best support the user experience, as shown in Figure 5. It may be tempting to view personality design as simply another layer, or veneer, on top of an existing system design. While this can work, ideally there should be some push and pull between saying and doing, so you should be willing to revise or add variations to your user flows if they help enrich the user experience. 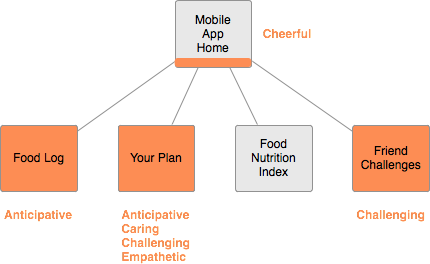 Example—The empathetic coach might realize that sharing a negative result wouldn’t really make sense, but adjusting a user’s healthy eating target might, as shown in Figure 6. Likewise, to challenge users who have met their target, the coach might encourage them to share their accomplishment with the world. As you go through this exercise, you’ll undoubtedly find a need to tailor the framework to suit the unique characteristics of your product and process. While the example I’ve used is a mobile app, the framework also applies to physical experiences and the maturing field of service design. When you play out an interaction as a conversation between the user and your product, the direction in which you should take your product’s personality will become obvious. Here are some practical tips to help you implement the personality design framework. Tip 1: Treat the interaction as a conversation. When you play out an interaction as a conversation between the user and your product, the direction in which you should take your product’s personality will become obvious. Don't go overboard or overreact in communicating personality through language. A little goes a long way. Tip 2 : Don’t be a ham. It’s okay to let your product’s personality take the limelight at times, but make sure it’s not annoying. Don't let cleverness impede users’ comprehension. If you need to provide information such as a confirmation code or task instructions, be clear. If the user’s task and context are casual, feel free to crack a joke, but don’t disrespect people’s time and attention. It’s a lot of work to design a full product personality. Prioritize your interaction points and work on the highest impact areas first, then move on to the other points as you have time. You may even see more efficiencies because you aren’t trying to tackle everything at once. Tip 4: Make sure defaults are personality neutral. Communication is messy, and users are bound to encounter the one case you didn’t think of. You wouldn’t want a cryptic system message to break the illusion of personality, so make sure that defaults are personality neutral. Tip 5: Design for the long term. Keep in mind that you are designing personality with the goal of providing a richer experience and, ideally, creating a long-term relationship with a user. So don’t be afraid to create a vision that will take more than a few iterations to realize. This will allow your first steps to be consistent with those that you take later, and people won’t be left wondering whether the product suffers from multiple-personality disorder. Personality design lets you breathe life into your product and elevate it to the role of a responsive social actor in the user’s world. Although personality design has been around for some time, we are still at the beginning stages of understanding the design of personalities for products. Depending on your project’s needs, you may choose a co-design method in which users’ tasks and emotional needs have an equal influence over product design. If you’re designing personality for an existing product, you can start by layering personality on its user interface, then dig deeper into enhancing functionality later on. Whatever method works best for you, the personality design framework that I’ve provided will give you a starting point for creating a product that meets your users’ social needs. Personality design lets you breathe life into your product and elevate it to the role of a responsive social actor in the user’s world. We already know how users behave in the wild, and it’s up to us, as UX designers, to bridge the social gap between users and our products. As you venture into personality design, develop your own vision of how your product can evolve from a mere commodity into a companion. Nice post! Thanks! I found a similar post that I’ll share: “Important Steps for Adding Personality in UX Design.” I hope this is helpful.